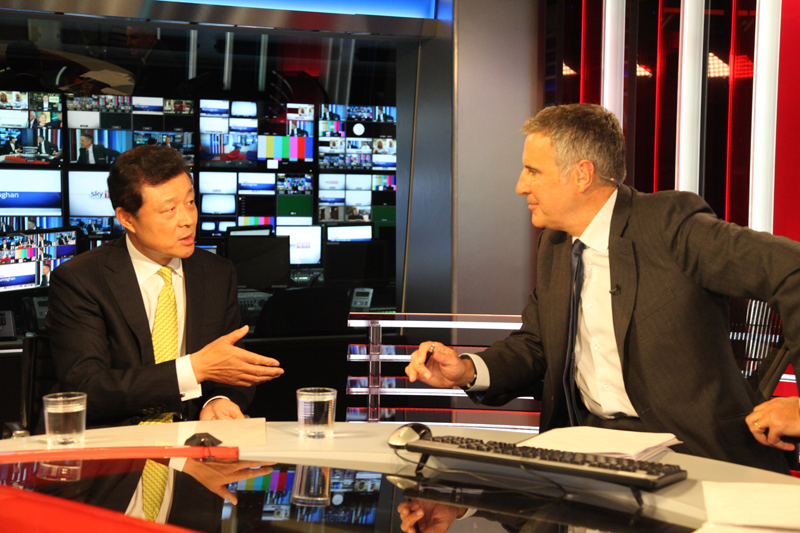 Murnaghan: I am joined by the Chinese Ambassador to the UK, H.E Liu Xiaoming. A very good morning to you, Ambassador. Murnaghan: A broad question first of all. Does UK have anything to fear from China? Liu: Nothing to fear about China. China is a peace-loving country and the president will be here for cooperation and partnership. And I think China and the UK have a lot to cooperate and we believe China and UK are two important countries of global influence. By working together, the two countries will help to build a better world, to promote prosperity and save the world peace. Murnaghan: Okay. I ask that question because I am sure you have had a look at it as well, our security service, MI5, has opened an accessible website talking to the British public and that it has a question and answer page about the current biggest threats to national security. And then we have, at number two, Chinese cyber terrorism. MI5 are concerned about China. Murnaghan: From where? Where do they emanate? Liu: From where? Everywhere, I would say. You know cyber space is not a safe place. Countries should work together rather than criticising each other. During President Xi's state visit, he and President Obama reached consensus that the governments will not support any cyber crime and we will not be supportive to any organisations to engage in cyber crimes. Murnaghan: Well, that's loud and clear. But why would MI5 have come up with this analysis that China is one of the biggest global threats on cyber crime? Murnaghan: … the media and security services say, there it is on the MI5 website. Liu: I think you should put this question to your MI5 and other people. But we are here, we are not spying on your nuclear facilities. I think we have more interest in doing something else: we are here for cooperation, for win-win. That is the whole purpose of Chinese investment here. Murnaghan: And I know that President Xi Jinping is going to have long discussions about the Northern Powerhouse, which I understand doesn't translate very easily into Chinese. Liu: Not that difficult. The Chinese language is very rich. I think Northern Powerhouse…do you speak mandarin? Murnaghan: No, I am afraid not. Liu: There are several translations, but at the end of the day we have found a very appropriate one. Murnaghan: Okay. That's good to hear. But there are concerns about what's going on in the northern parts of Britain at the moment. When it comes to the steel industry, again, there are big concerns about the Chinese as a huge producer of steel. Do you accept criticisms of China that China has now got massive overcapacity in steel and is dumping it on global markets. Instead of a Northern Powerhouse, you are creating, as one of our newspapers says this morning, a "northern poorhouse"? Liu: I think every country has to adjust itself to this globalization, even in the case of China. China used to be a processing power for clothes, for toy in the past. I think China exported maybe 90% or 80% of toys to this country and to the United States. But we are now faced with very competitive neighbours in Southern Asia and Southeast Asian countries. As their labours are more competitive and cost lower, business move from China to those countries. So we have to adjust from processing to manufacturing. I think any country, every country, has to adjust itselt. And we, of course we are here and, we should accommodate, you know, looking for common ground between China and the UK. We certainly will address concerns of the environment here. We certainly will address concerns of the local community. Murnaghan: Don't you believe there is reason for, you must have seen it, you are the Ambassador, concerns about Chinese human rights records. Particularly things about the mass number of people executed in China and things like that. The Prime Minister said we oppose death penalty everywhere and anywhere and we will raise it at all opportunities. Presumably the Prime Minister is going to do this with the President. Do you think that is rude? Liu: First of all, I would say, I have been here for five years and I have heard a lot of comments about human rights in China. But I think more often than not, people miss the big picture of human rights in China. What is human right? Murnaghan: The right for a fair trial and not to be summary executed. Liu: The basic right is for people to have better living. I think people sometimes, when they talk about human rights, they miss the picture that China, in only 30 years, elevated 600 million people out of poverty. No other country has done that within such a short time. And Chinese people are living better, living longer and they enjoying their happy life. Even in their political life, I think not in any part of history of China did people enjoy unprecedented dignity and freedom. You are talking about death penalty. China is a large country. To run a country of 1.3 billion will be naturally different from running a country of 64 million. The penalty has been handled in a very careful way, and the number reduced with each passing year. And it has to be approved by the Supreme Court that it has come through a very careful process. Murnaghan: Running of time. Last question about the Labour leader Jeremy Corbyn. You will have viewed his election with interest. Have you had any substantive discussions between on your President and the leader of the Labour Party, the leader of the Opposition? 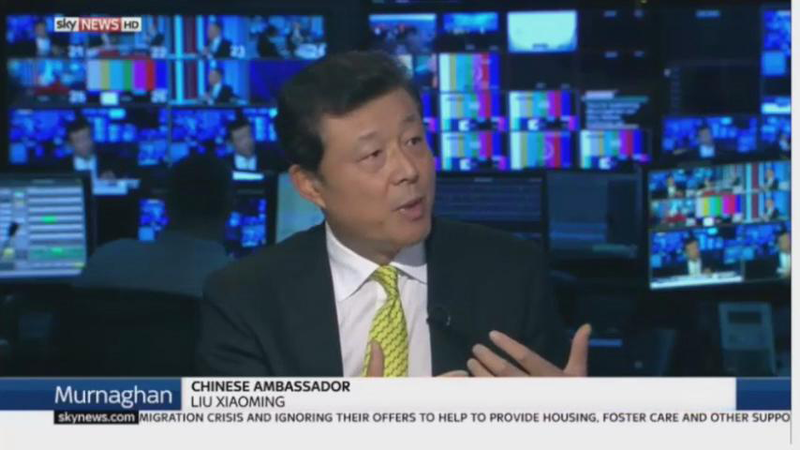 Liu: President Xi will have a meeting with Jeremy Corbyn during the state visit at Buckingham Palace. We look forward to a productive, interesting meeting between the President and Jeremy Corbyn as the Leader of the Labour Party. Murnaghan: And do you think you will get on well with him? He is a socialist and you are a communist. Liu: You know, socialists can debate. Socialists and communists can have a debate .But we are here for common ground. In fact last week I had an interesting meeting with Jeremy Corbyn, to prepare for the President's meeting with him. I think the Labour Party has made its important contributions to developing relationship between our two countries. And currently we have very strong party-to-party exchange relationship, with both the Conservative Party and the Labour. And I sincerely hope the Labour Party, under the leadership of Jeremy Corbyn, will continue to make its positive contributions to this important relationship. Murnaghan: Your Excellency, we're out of time. It's great to see you. Thank you very much indeed. Here is to a successful visit. Sky News is the second largest broadcaster after the BBC, providing 24 hours news broadcasting in the UK, with more than 7.5 million audiences. Murnaghan is the flagship current affairs programme known for its in-depth debate and discussions. Dermot Murnaghan is a senior presenter for Sky News.